Targeted visitors are most important of any blog. Retention blog visitors more and more important. If you want to increase your facebook like then should promote your page in your blog with your blog's users. Then you will get more like from your users who visit your blog. Adding the pop up like box is most essential for get more like. So today i am gonna to share a tutorial about pop up facebook like box for blogger. Recently i found a popup jQuery named Easy Static Modal Popup Plugin. I used this jQuery in this popup facebook like box widget. eZmodal is a simple and fast jQuery plugin which enables you to display static html content in a responsive, fully configurable modal popup window. This a best popup plugin. Thats why i used eZmodal in this widget. In first load, in this widget shown a loader. This loader like below screenshot. Using facebook like box you may keep your visitors in your touch. This way is another great way for increase blog traffic. 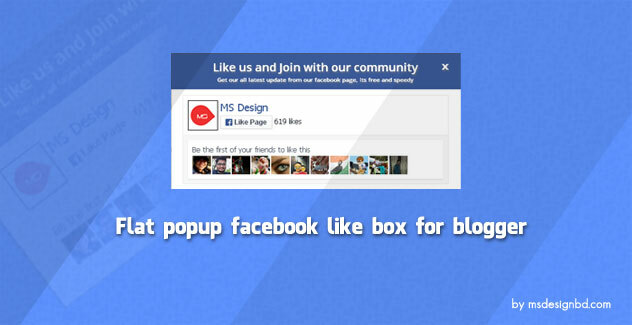 Popup facebook like box is great way for promote your fan page with your blog visitors. Proper use of like box, you can get more like for your fan page. Facebook is a great way for increase blog traffic. When you share your content on your facebook page, then here is an opportunity to share your content by your visitor with others. In this way can get more extra traffic. In this circumstance you have must need promote your page with your blog. Popup like box is one of the best way. Now lets start the tutorial. Before start work, please take a backup of your template. Step2: Now past below code before </body> tag. Note: Change msdesign.rtml with your facebook page username. Bikin berat blog gak ini gan ? Then you need to use some cookies..
it's just showing loading......... image, but not displaying the FB page! why? Your pop-up design is a good one. Can we make it responsive which can fit to mobile screen? Please..how to add facebook like popup responsive, work on smartphone with timer. And automatic close if some people like. Thank you..
Hi, please is the new version that support cookie available yet? Thanks. Love your blog. Very informative. Thank you, it looks amazing and so elegant on my blog but I got a question. Is it responsive? Nope, But update version coming soon. Hi, I am using the free palki ultimate template and I added the html code in the sidebar. The likebox appeared in the sidebar. How can I make it appear in the center of the website and only in the home page? Hi, how do, if I just want to come out once a day per visitor and the message disappears after 4 seconds? how to create date expired in popup? Thank You! It's damn good and excellent. You have good creativity in design. Thank you very much msdesignbd. ভাই বর্তমানে ms design এ যে pop up like বাটনটা আছে সেটা কই পাবো? Yes This One Is Working Thanks Buddy! Great job keep it up thanks.